I've been thinking a lot about planning and organizing and writing it all down. I love lists. So, I've been thinking, thinking, thinking. I've been thinking while I drive and thinking while I vacuum and thinking while I sort a million boxes of out-size, out-season clothes. I've been thinking while I pack up some of the Christmas decorations, thinking while I clean out my closet (which previously held all the Christmas chaos), thinking while I de-clutter and streamline the learning room. I've been thinking while I go to ballet, to basketball, to indoor soccer, to outdoor soccer. That's a lot of thinking. And the thing I think the most is that whatever I commit to paper or 'puter, it's got to be simple because for all my thinking, there's just not a whole lot of time to write it all down. In this family, we've been open to life for twenty years and now, our house is teeming with life, thank God. So, mostly my thinking has been limited to what's working, because, frankly, I haven't time to waste on what's not working. Let's just go with what's good enough and get on with the show. For 2008, "good enough" is the new excellent. 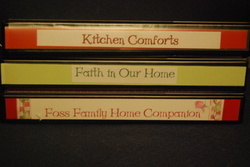 It's working to divide that original Home Companion Book into three: The Faith Book, The Kitchen Book, and The Home Management Book. There are calendars specific to each of them and that works just fine. 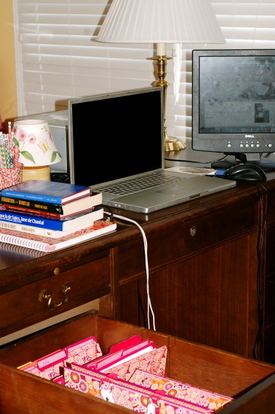 I guess there should be a book for "school," but honestly it's all in the computer and it's much less cluttered there. 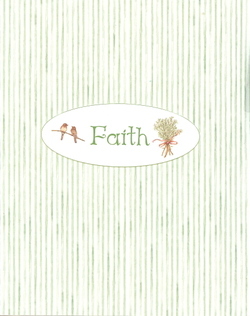 In the Faith Book, there are dividers for every month and a divider for Lent and the Easter season (since those don't fit neatly into a particular month). Behind each divider, I am saving novena prayers, tea and a craft ideas and craft of the week ideas, and ideas from other bloggers. I'm printing from Catholic Culture as necessary and making notes of my own middle of the night inspiration. I have found that when a great idea appears on my computer screen, it helps me enormously to cut and paste it to a Word document and print it. Then, I put it in the binder and I try very hard to let go of any guilt it has inspired. If it is possible for me to get to that great idea and put it into action in my house in the near future, I do. If not, I know it's there. It won't disappear if the website does. It is not urgent. If it's a great idea this year, it will still be a great idea next year. Or when I no longer have a nursing baby. Or when I'm looking for something wonderful and creative and nurturing to do with my grandchildren. The liturgical year goes around and around and around again. Ever old, ever new. We don't have to do it all today; we can save some for later. That's the beauty of the binder. No guilt. Another component of the faith binder is a page with the Mother's Liturgy of the Hours, taken from Holly's Notebook. Here's where I've sketched out a general rhythm of prayer. Again, the plan is in place, but it sure would be a shame if I made myself unavailable for a child who needed me or cranked up the cranky to meet the schedule, thereby sinning in order to pray. God knows that good enough is the new excellent. The Kitchen Book holds all the things it did when it was a section in the big book, now updated to reflect the current state of my kitchen. A weekly menu. Yes, this used to be a three week cycle menu. No longer. Now, it is the epitome of boring simplicity. It works for me. The grocery buying is fine tuned to the point that I do my co-op ordering and then I can send a teenaged boy into Costco and have him emerge with the week's groceries eighteen minutes later. That's pretty streamlined:-). I cook. I love to cook. But I'd rather spend my time in the roll-up-your-sleeves, tie-on-your-apron place than in front of the computer or the cookbooks planning meal after meal. If I can get a homecooked meal on the table every night and feed everyone reasonable lunches and dinners, that's good enough. And good enough is the new excellent, remember? 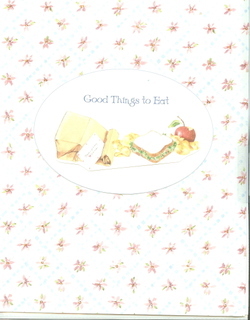 All the recipes that go with the meals in the cycle menu are in the kitchen book which is kept in the kitchen:-). The co-op order form (we order all our poultry, eggs, butter and many dry goods from a Virginia farm once a month) is in the kitchen book so that I can make pen and paper notes during the month. Ordering happens online. An inventory of all the food in the upright freezer (twice a year, we order a side of beef) is kept current (or as current as possible when midnight marauders eat steak surreptitiously and think no one will notice). Then, there is a calendar section to this binder, too. Here's where the seasonal recipes go. The pumpkin cake we always have on Halloween, the Seder dinner recipes, the Easter menu and recipes and directions for the lamb cake, the peppermint bark recipe--it's all here ready to remind me and to take the stress out of continuing traditions. 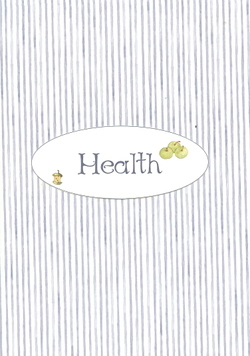 Finally, I've included diet diary forms from Holly Pierlot's Mother's rule of Life Workbook. It's helpful for me to see exactly what I'm putting in my mouth. 'Nuff said there. The idea here for me is to commit it to paper once and then let it go from my brain. I'm not going to think about what to have for dinner on Monday night until the seasons change again. I'm finished thinking about it. I'm not going to think through a grocery list. If the menu plan isn't perfect (and it isn't), it's adequate and everyone is growing well. So, I'm moving away from the plans and onto the real world in my kitchen. The Home Management notebook is remarkably unchanged since the original post. I did download Motivated Moms 2008 schedule. For $8, it's a bargain. It isn't adequate to cover the housekeeping needs of a family my size in a house like mine, but it's a good start. I refer to it in order to update my weekly chore list with things that I might not have considered. Since the original post I have re-written the chore chart to reflect the departure of my greatest asset (Michael left for college).For the children, having the chores committed to paper is crucial. There is no confusion about whose night it is to clean the kitchen or whether the family room needs vacuuming. For me, the discipline most required is self-discipline. I know better than to expect what I don't inspect. I need to do a whole lot of inspecting. Now, let's get real. The thinking, thinking, thinking is important. I don't think anyone can manage a household and a large family without giving earnest thought to goals and routines. We need to be thoughtful; we need to consider constantly where we are and where we want to be. But, we also need to recognize, that, in the words of a wise mother of many, "some stuff is going to happen." Every day, usually several times a day, some stuff is going to happen. And it won't be the stuff on the lists. It will be other stuff. And because of the other stuff, some stuff is going to be undone. The prayerful planning allows us to focus, but it's the willingness to relinquish the plans for the greater good that leaves us open to His abundant grace. And that--that openness--is what it is to truly be open to life. Visit Red Sea School for the Carnival of Homeschooling and more calendar ideas than you can imagine. I'm not exaggerating; I've never seen such a huge carnival! 1. Invite the Blessed Mother to my home. . .daily, with a Memorare for the intention of asking her to visit me as she did her cousin, and to help me keep my eyes toward heaven. 3. Take on little things to help our household stay beautiful and joyful. Don't you love a new calendar, all fresh and clean and ready to take on the adventures that await in a brand new year? Last year, I used a MomAgenda. I was disappointed with the some of the features (mostly offensive quotes that jumped out at me and made me sorry I paid for the privilege of reading them again and again for a week). But I did love the column format of the MomAgenda, even if the columns close to the binding were a bit difficult to use. It was all bound into a book--sometimes a pro, sometimes a con. In September, I started using Google Calendar. I'm still using it, though not as regularly as I should. The nice thing about Google Calendar (well, one of the nice things) is that as soon as I get an email from a coach or a teammate about a practice or event, I can add it directly. No searching for the planner which might be in my diaper bag or might be in the kitchen. The bad thing about Google Calendar? It's not in my diaper bag or the kitchen. The good thing about Google Calendar? I can share the calendar with my husband and with friends, too (a huge blessing when I was tweaking learning schedules). I created a calendar for each child's school plans, a liturgical year calendar, an appointment and activity calendar, a calendar for household chores. 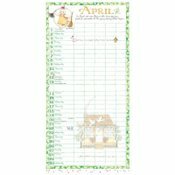 I was a calendar-crazed mama! These are printable, though not nearly as nice to print as the calendars one can create on a Mac. Sigh. All that work and I ended up with calendar envy.I'm still tweaking my Google calendars and hoping the geniuses at Google will figure out way to take all the extraneous junk out of the printable versions. Or that I get a Mac for my birthday. In the meantime, I miss my kitchen refrigerator at-a-glance-where-is-everybody calendar. I wanted something pretty and warm that celebrated the season in a family's life. It's no secret I'm a huge fan of Susan Branch. 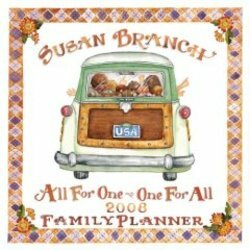 This year, I'm going to use The All for One and One for All 2008 Family Planner. Susan says that her greatest claim to fame was being the oldest of eight children. This is a family -friendly calendar with columns like the MomAgenda. (There are only five columns, though, which means I might need two.) Instead of politically charged demoralizing quotes there are delightful illustrations and a sprinkling of happy thoughts. Here's an interesting little tidbit: my husband sat and flipped through the entire thing and read all the notes and such. He even noticed all the eye-candy. This is a man who's most recent calendar is dated 1997. And it's not written in at all. At least he looked at this one:-). I think this one will end up duplicating the online appointments and activities calendar but it will stay put on the fridge for reference. The Google one will catch all the updates and it will be printed when necessary for Dad.I'll continue to rely on checking in with Catholic Culture daily to plan ahead and to immerse myself in the day of the Church. As I do that, I note what I want to remember on the Google Calendar for the liturgical year. Eventually, Google will work out its print issues and won't I have a great printable resource for my Faith Home Companion notebook? I have ceased searching for the perfect calendar for my organizing purposes. Very few (no?) planner people are planning for ten people in a household. Then again, I once talked to Sean Covey about his planners and he has a whole gaggle of kids. We agreed then that the Simplicity pages worked best for large household management.I haven't yet tried Franklin Covey electronic planning. Maybe that would be the solution...Probably not. I have trouble seeing past the whole corporate mentality. I'm organizing and inspiring a family, not running a business. There's a huge difference and that difference really needs to be reflected from the get go. If our planning has a purpose, it has to be a family purpose. Really, there is no perfect planner. I know that. The key to making all this planning and preparing work is discipline. I need to decide on a system and then work the system.I can tweak a bit as we go and read about other ideas, but in the end, what matters most is that I am faithful enough to stick with it. No planning system works if it's abandoned the third week of January for nothing, or even for the next thing to come along. I can't establish rhythm if I'm twisting in the wind, whether I'm looking for that rhythm in my household management, my school plans, or my prayer life. 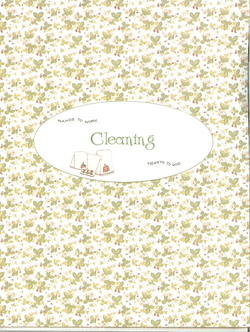 My homemaking notebook is about a year old. I have to say that I'm very grateful Kim talked me into this endeavor. And, tonight, I'm very appreciative of her gift to me. I was appreciative when she first sent me the binder and the dividers. They were beautiful and she perfectly nailed my "graphic personality." A little country, a little Susan Branch. I want Kim to come decorate my house--she could probably make it look more "me" than I can. But, now that I've undertaken a little makeover, I'm even more appreciative. It takes some effort to make these look beautiful! I recycled some of Kim's work and added some fresh paper where needed. And they're so pretty, I'm inspired all over again! My binder was becoming big and cumbersome and was looking a little rough around the edges. So, I bought three smaller, heavyduty binders and set about to break the big binder apart. 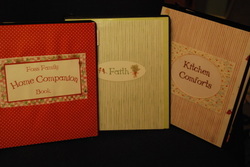 I made a kitchen binder (and named it after my kitchen blog), a "faith in our home" binder where I will keep all my notes for our family's celebrations of the liturgical year, and a home management binder for schedules and chores/cleaning routines, and everything else that was in the big book. I'm pleased with the way they look. Very inspiring. Do you wonder what's in them? I'm working on it. Stay tuned. Now that Kim has given you the history behind our home management notebooks, I'd love to share my details. Kim and I discussed what we wanted out of these over the course of several months. We're both very visual and we agreed they had to be pretty. We had to want to handle them frequently and we wanted to be rewarded when we looked at them. She's a graphic genius and she sent me my cover inserts and divider pages. They were all the inspiration I needed to take off on my own. We both had taken to heart stories like this one and this one, and since we were both pregnant, they were in the back of our minds as we sought to put on paper everything we knew would make our households run more smoothly. The chance of our demise notwithstanding, there were other reasons for committing household routines and rhythms to paper. We saw these binders as works in progress and we knew that they would become the living books with which we could teach our daughters to keep house. That's why we both chose visual themes with our daughters in mind. And we also knew that the exercise of thinking these things through would only benefit our families, not just in the long run, but in the near term. When a bottle of red wine fell off the top of the refrigerator and onto the granite counter below, thoroughly drenching my copies of Heart of the Home and Autumn from the Heart of the Home, I cried. Then, I blotted and reconciled myself to the fact that now I had lots and lots of pages to cut and paste in order to add graphics to my planning pages. I downloaded the same font she'd used for the dividers from Two Peas in a Bucket. I wanted all the pages in the same font if at all possible. For purposes of this post, I have saved all the downloads in a plain Word font, since you wouldn't be able to read them in the Two Peas font unless you'd downloaded it as well. Clear as mud so far? I have already benefitted enormously from this book. I had all these routines in place by midsummer and my children and I were well practiced before the fall and the stresses that came with it. Within a two week span, my husband changed jobs (from one that had him traveling often and working at home to one that has him traveling still but working in a downtown office as well) and we added a baby to the family. Add to that the beginning of the school year, a new activity schedule, and some nasty viral illnesses and I could have been looking at utter chaos. Thanks to the help of some very dear friends and to the forethought of the plan, we are surviving rather well. It's not perfect and my house doesn't look like a Better Homes and Gardens spread, but it's functional and when we put our minds to it, it's downright lovely. and then I added this post to remind myself why I am doing this whole homemaking thing. 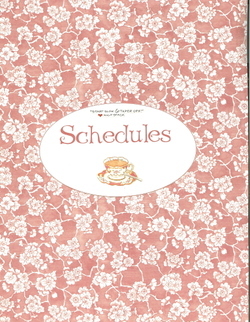 The Schedules section of the binder begins with a master schedule for the week. I've listed, by day, where each child goes and how they get to and from. 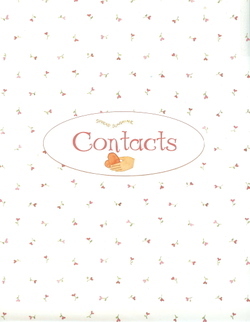 Behind that are pages that include all the game and dance rehearsal schedules, directions to all the fields for the current season, my husband's travel schedule, the local school schedule and any correspondence from coaches or dance teachers. I keep a few empty page protectors there so that I can file things the minute they get home. The names and numbers of all doctors and dentists and the pharmacy. A list of symptoms and herbal remedies. All the great liturgical year ideas I've gleaned from places like the 4Real boards, the Cottage, and Jenn Miller. This section is growing very fat. 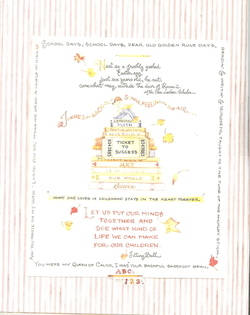 The Home Education section includes the plan for each child that I wrote this summer. Those are all linked on the sidebar of this blog. the back page from our community news magazine which has all the names and numbers of local offices and merchants. a printed list of the names, phone numbers, and snail mail addresses of all the 4Real Message board moderators. Whew! I'm having such fun reading others' ideas and plans for management notebooks and I'm sure glad that I bought a two inch binder from the get-go. I see much adding in my future. 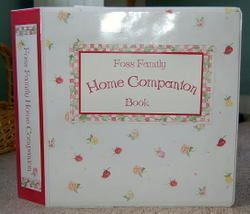 For more on Homemaking Companion Books click here.